Send me news about upcoming events and latest news. Hockliffe is situated midway between Dunstable and Milton Keynes on the A5. The farm is one mile from Hockliffe, on the Hockliffe to Woburn Road (A4012). From A5 north (Milton Keynes): follow A5 towards Dunstable. At the Hockliffe traffic lights, turn left onto A4012 (Woburn road), the farm is approximately ¾ mile on the right hand side. From A5 south (Dunstable): follow A5 towards Milton Keynes. At the Hockliffe traffic lights, turn right onto A4012 (Woburn road), farm is approximately ¾ mile on the right hand side. 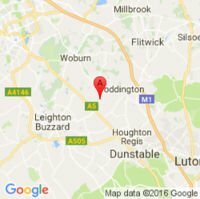 From Bedford: Follow A421 to Junction 13, where you follow the signs to Woburn. Once at Woburn, turn left onto the A4012. Continue on the A4012 for approximately 3 ½ miles. The farm is on your left.